Minnesota’s Amy Christie popped up in a news clipping about her current gallery show. She’s a mixed media artist who uses heavy texture, deep color and sculptural elements in mostly large scale works. Her materials include polymer clay, paint, paper, inks and wire. 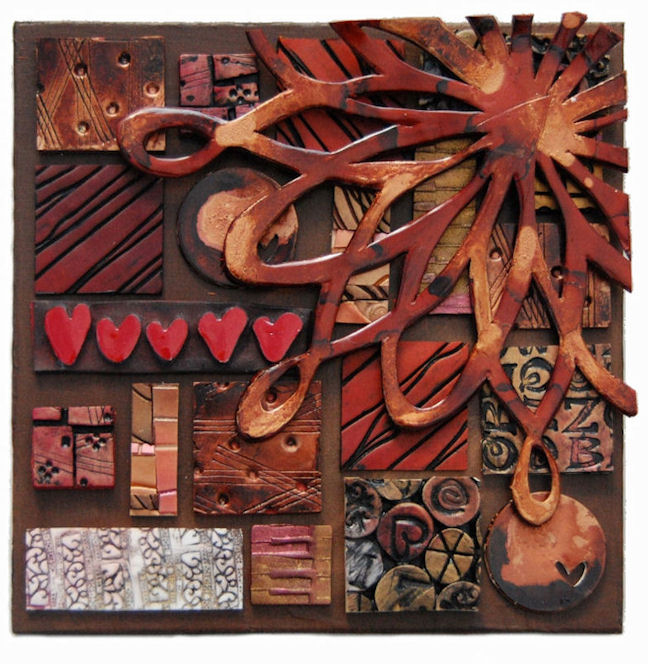 Amy’s layered mosaics have a distinctive look and you will be itching to see more. For an idea of the size of her art, try this link. Here’s a bit on Facebook and her blog. Amy’s work is fabulous, I’ve enjoyed spending time on her pages this morning and will be going back for more. Thank you Cynthia for sharing her work with us. Amazing! work I like her work because she use different kinds of work in one canvas. Thank you so much for the feature! Wow! Hi Cynthia. You are an amazing polymer clay and mixed media artist! I enjoy your stuff and your style!